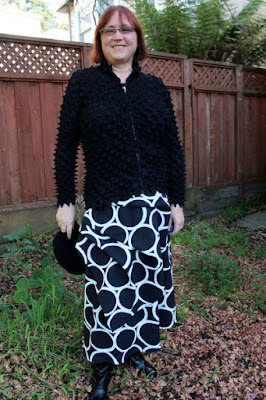 I made this skirt over Thanksgiving weekend, last November. 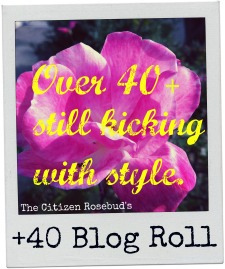 I didn't blog it at the time, because I wanted to make another one using a different sort of fabric. But I haven't gotten around to it yet. I haven't sewn this week. Work was busy to begin with, and then we went into crisis mode and kicked into high gear. I worked Friday evening and pretty much all weekend. So maybe it's a lucky thing I didn't blog this skirt before, so I have something to post. This is a great pattern, and I am not sure why people aren't falling over themselves to make it. 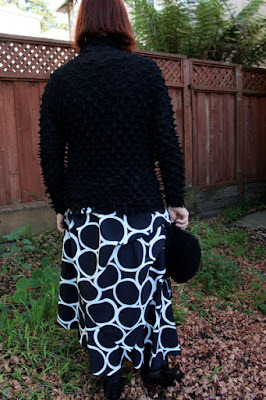 It's an updated version of a previous Betzina skirt pattern that I also loved (and made 5 or 6 times), Vogue 1018. This updated version has eliminated the 60 tucks, making it easier to sew. It has also replaced the waistband/zipper combo with an elastic waistband, which I also did on my versions of 1018. You might be wondering: what the heck are you wearing with that skirt, Shams? I am wearing a Japanese jacket that I purchased used. Margy calls it my Porcupine Suit. I took a walk this afternoon, after hours and hours of working. It was a sunny afternoon, so I enjoyed taking cell phone pics of the porcupine fabric. 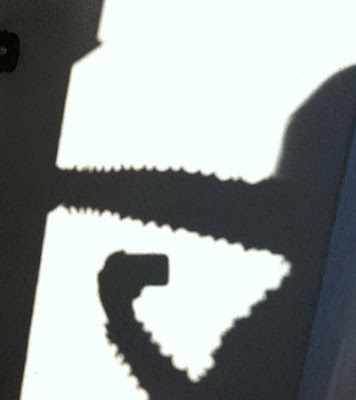 I especially love the shadows it creates. Also, thanks so much for your feedback on my "Epic Fail" jacket. I really appreciate all of your supportive comments and suggestions. For now the jacket is going into a closet, but I may revisit it later, if the mood moves me. Skirt is great and graphic...and I LOVE the porcupine suit! That skirt is HOT!!! I love the graphic print you chose. The porcupine jacket is really cute. I like your 'crazy' outfit. The top almost looks organic and maybe has secret life of its own! Your skirt looks amazing! I have this pattern, after seeing yours I want to make one too. 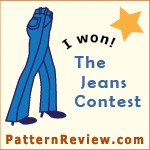 Nice to know the pattern works with wovens. Awesomeness! The porcupine, the skirt, the photo - yes indeed, awesomeness! You look fantastic! You, the skirt and the porcupine. Thanks for sharing. Great skirt. I love that your taste is so 'edgy'. Wish I could pinch a bit of that! Great outfit, and perfect skirt. Yes, I am falling over myself to make that pattern! Just finishing off the already cut out pile first! Nice skirt Shams - but I LOVE that jacket! Wouldn't it be nice to find fabric like that. Oh, I have been afeared of that skirt pattern, but you as always inspire and challenge me- I'm getting it out! You look fantastic in this. The porcupine jacket is amazing and looks wonderful with the skirt. I would never in a million years make this skirt with my hips, but the whole effect gives you a balanced figure. Definitely make this again. That's a fabulous skirt. I wonder if the fabric feels a bit "plastic-y", as some home dec does. Definitely make it again. Love the porcupine jacket. It is so you! I really like this outfit; the jacket is priceless! You have convinced me I need this skirt pattern. Now to wait for the next sale! And then...........I open my e-mail, and there is a $3.99 sale on vogue patterns...go figure! Oh, I am so jealous of the jacket!! And the skirt is quite lovely - understand about the "strange coating" on the back of home dec fabrics. They can make it a little odd to use for clothing. But I like it! Awesome! I'd love to see this skirt on you in a different fabric, it's a good one. 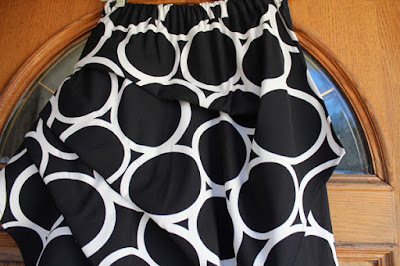 That skirt pattern has been on my counter for a few weeks now as the skirt I want to sew next. I'm just trying to figure out the best fabric. I think it needs to have a bit of fun to it. Good info about using a woven. Thanks for the inspiration. You look fabulous in the skirt. I love the fabric. Nice thing about the Internet is that wecam't feel the fabric, so all I can say is, it looks great to me!! I have the older SB pattern and I really like it..a lot. Hope you don't have to work too hard this week. Dear Shams, You look great in this outfit. The close fitting jacket and wide skirt balance your figure and make you look much slimmer. You should wear more outfits that have volume on the bottom and are closer fitting on top. It looks great! I sure do like the skirt and the fabric you used. I bought that pattern a few weeks ago...haven't made it yet. I'd like to know if the fabric Vogue used is printed that way or if they pieced different fabrics together. Wouldn't that be fun to do? Love your skirt AND the porcupine jacket. Margy was spot on with that name. The skirt looks wonderful on you. This pattern has been on my short list of patterns to be made up, so thanks for the insight. Beautiful texture in the porcupine top. I love the color differences in the crevices shown in the close-up of the sleeve. Is the color really tonal like that or is it a trick of the light? or is the fabric sheer, thus causing the color difference by the way the light shows through? way cool! Good eye, Marcy! The fabric is somewhat sheer. That's a great look for you, Sharon. Striking and modern but not outlandish. Oh, how I'd love to make some of that fabric in your top. 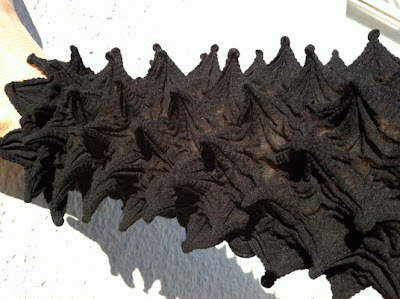 It looks like a Shibori technique but not used to create pattern in flat cloth, it was used to make texture. How fun! Your skirt is wonderful! I have that original pattern too... the one made up all in red with a matching red skivvy on the cover photograph... 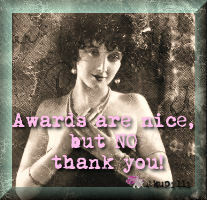 I really should make it up sometime! The porcupine jacket is completely awesome, I can see why it is one of your favourites! Great skirt, Shams! My but you surely have gotten tiny. You do look great. Fantastic skirt -- I love the shape. 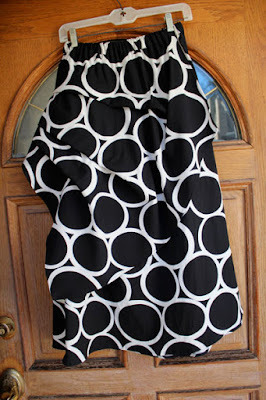 It is definitely worth making in other fabrics! 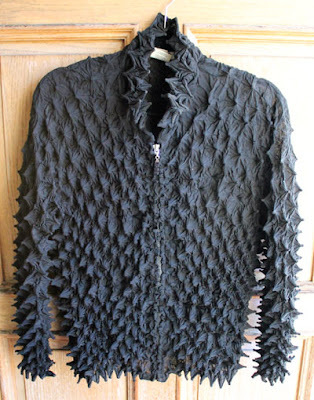 The porcupine jacket is too wonderful -- great texture. Thanks for reviewing this! I have the pattern and am anxious to make it, but didn't quite have the "right" knit. I am happy that it works with wovens too. What a cute skirt! I love the way the circles play with the drapes. And, that top! What a fabric! Oops! I almost missed this skirt. I want to try one of Betzina's patterns, they look quite interesting. I love how it has turn out, it is spectacular, and it is really hard to steal the show from that porcupine jacket...how did they achieve that shape with fabric, I don't know. Much as I might like to, I won't be copying you on this skirt, as I could definitely not pull it off. It suits you wonderfully, and love that top. The whole outfit is gorgeous. wow, what a great outfit! Too bad the fabric is weird - that part doesn't come across in the pictures. I like the silhouette pic of the porcupine jacket. Glad you got a break from the work marathon, too. I think the skirt came out quite lovely, I know you said the fabric is "weird", but you can't tell in the photo's. I know you said you might do it again in another fabric, even though I like the black & white, it would be interesting to see what else you would do.